Saikat Chakrabarti is Rep. Alexandria Ocasio-Cortez chief of staff and managed her 2018 campaign. Chakrabarti and Ocasio-Cortez held majority control of Justice Democrats up to February 2019. The Justice Democrats appears to be an organization that is a money-laundering operation for illegal campaign donations. Ocasio-Cortez and Chakrabarti obtained majority control of Justice Democrats PAC in December 2017. Justice Democrats PAC raised more than $1.8 million before her June 2018 primary. Ocasio-Cortez never reported to the Federal Election Commission that she and Chakrabarti, who served as her campaign chair, controlled the PAC while it paid money to her 2018 campaign committee. Armenian holocaust denier Cenk Uygur was forced from the board of Justice Democrats for what Chakrabarti called “extremely disturbing sexist and racist statements" in December 2017, followed by Kyle Kulinski of the Young Turks who quit the same month. Justice Democrats then reported that Ocasio-Cortez and Chakrabarti were “governors” of the organization in a document submitted to the Washington, D.C. Department of Consumer & Regulatory Affairs on March 28, 2018. A third listed governor was the PAC's treasurer, Nasim Thompson. A Federal Election Commission complaint was filed alleging money laundering campaign donations to her boyfriend. Brand New Congress, a Soros front that helped her get elected. Early on, her website was a redirect page for the group Brand New Congress, archives in the Wayback Machine show. Brand New Congress paid Ocasio-Cortez's live-in boyfriend money in excess of campaign contribution limits. Ocasio-Cortez had her boyfriend on her Congressional payroll staff after she took office. She later denied he was staff, but had granted unfettered access to her office IT system to unauthorized persons. 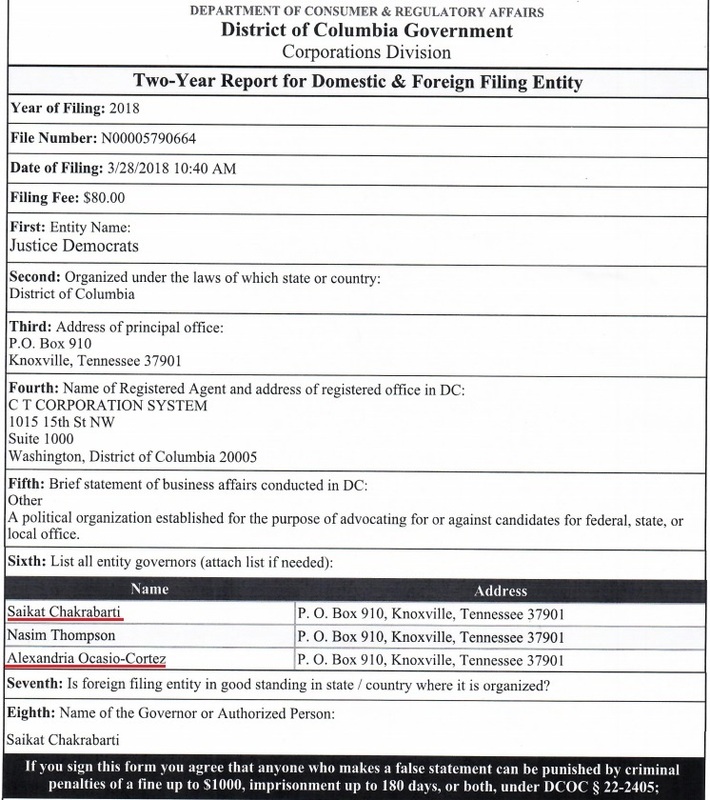 Additionally, Chakrabarti has been accused of funneling $1 million to two companies he controlled in a complaint filed by the National Legal and Policy Center with the Federal Election Commission. According to the Brand New Congress website, the PAC would build a "unified campaign" infrastructure including fundraising, organizing, rallies, and advertising progressive congressional candidates across the country could "plug into," saving the individual campaigns time and money. This page was last modified on 31 March 2019, at 00:08.